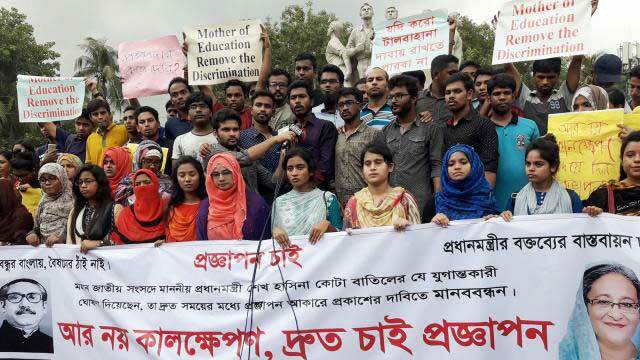 Dhaka, May 9 (Just News): Bangladesh General Students Rights Protection Alliance on Wednesday gave the government a 24-hour ultimatum to publish a gazette notification on abolishing quota system in government jobs as per the Prime Minister's announcement. Hasan Al Mamun said, "We hope the government will take steps for publishing a gazette by Thursday as per as Prime Minister Sheikh Hasina's announcement at the Jatiya Sangsad." "If the government doesn't fulfill our demand within the timeframe, we'll go for a tougher movement from Sunday along across the country." he added.